Morel is the creative collective space where we brainstorm, drink strong coffee, get giddy over inspiring projects, and work together to generate solutions to problems we are passionate about. This is what we started 8 months ago. A labor of love among 3 friends. Since then we collaborated with The Marshall Project to create a destination place for the conversation around the criminal justice system. We built a new branding system and website for The Center for Digital Arts and animated the importance of the Census. We helped create a new framework for Storyful, and blasted off on a crazy space adventure with the Voyager Mission for National Geographic. 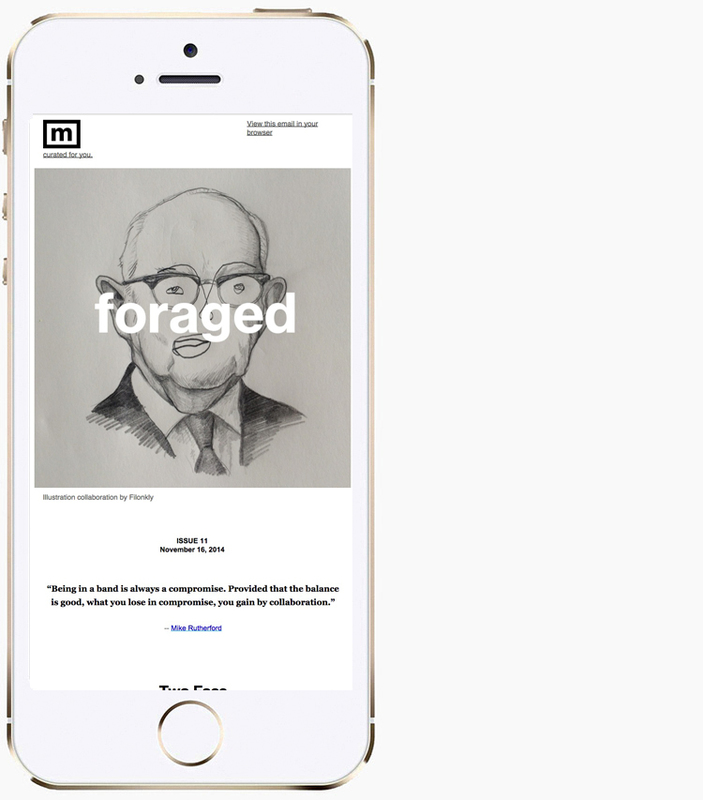 And along the way we enjoyed publishing own quirky newsletter, Foraged where we feature oddities and findings on the web while featuring a few super talented curators. We have more in the works too! Look for a personal interactive documentary about Ocean Falls made in collaboration with the National Film Board of Canada, a fresh, new branding system for Thunder 11, and a new digital multimedia magazine about immigration made with Talking Eyes Media, VII Photography and Rutgers University called Newest Americans. We feel incredibly lucky to have been able to work on the range of projects with the teams of people that we have. And the journey continues but now down a slightly different path. We’ve always seen morel as an evolving collective, a mind meld where we come together to make stuff we care about, and it will continue to be so. But for the foreseeable future morel will be evolving to take on only a few special projects while we explore some individual opportunities that have arisen. As always we are grateful to you for your support and we can’t wait to share the next chapter with you. We recently came across Thomas Dagg's photography series where he merged the Star Wars world and characters with our real world. It was like he had gone into our childhood minds and encapsulated what we had imagined every day. We emailed him and asked him a few questions about his wonderful and whimsical series. Go here to see/read it. This issue is curated by Reanna Evoy, friend, art director, shoe fetishist and arbiter of cool. Thanks Reanna! This issue is dedicated to small but mighty teams. A lovely father/son exchange, The Marshall Project launch, and the group effort around global science. Happy reading! We fell in love with this wonderful artistic collaboration between Chris Lynn and his son Moses. This week was all about connection, communication, & networks–digital and analog. But mostly we just wanted an excuse to reach out to Graham at the NYTimes about his latest project! You can see the latest issue here. Or you can subscribe for the next version of foraged here. Enjoy! The 7th issue of foraged is just off the internet press. We were obsessed with the obsessed in this issue, those who spend their lives exploring the upclose and the intimate. You can see the most recent version here and if you're keen to get issue 08 to your inbox, subscribe! Our latest field trip to a remote town in Northern British Columbia. See the multimedia essay here! Since we are currently in transition we are fascinated by everything around us that is evolving, adapting, and in-process. Thus the theme of our latest issue of foraged. Peruse it here or if you're feeling bold you can subscribe to get the next themed issue. Q&A: Frédéric Dubois Creator of "Atterwasch"
When we first saw the interactive documentary "atterwasch" our whole team dropped everything and got sucked into the experience. It's a haunting cautionary tale about a tiny German town struggling to exist while a Swedish energy company threatens to demolish their village and strip-mine it to harvest brown coal. The story begins in the far future, imagining an apocalyptic world where the mining operations consume the landscape, then moves back in time to the earliest days of the town’s existence. We caught up with author and producer Frédéric Dubois for insights into how they made this gorgeous, cinematic story. How did the Atterwasch project come about? My pal photographer Marco del Pra' and myself were both completely blown away when we heard that villages were still being removed in Germany to make way for coal extraction. We couldn't believe it, and so we drove down from Berlin to the Lusatia region to get the story from the horse's mouth. There, we drove into Atterwasch and thought "wait a minute, this is it." Clearly there was a sophisticated team in place, can you illuminate some details about the production process and timeline? The project took 10 months to produce, from concept to delivery. Marco and I developed the storyline, worked out the storyboard with gifted illustrator Edith Carron and went into production with the coders at Honig Studios, sound designer Hannes Schulz and web designer Olivier Guillard. There were tons of iterations and many production steps, such as finding the funds, organizing the trips to Atterwasch and negotiating the interactive storytelling part. Why did you chose to make this a scroll-down documentary and how did that shape your vision for the narrative? Frédéric Dubois, Author and Producer of Atterwasch. We were clear on the fact that we wanted to confront the viewer with a village that has been removed and so we decided to start the experience in the future, making it possible to scroll back history, so to speak. We thought that this dramatic twist would work well with the story and the technology. How does the interactive documentary form appeal to you as a storyteller? Interactive documentaries are my passion. I used to work for the National Film Board in Montreal and developed the gusto there. Now I'm trying to make a living by authoring and producing internet-adapted documentaries. I believe in the internet as a place where we can tell long stories, where we can experiment and play. This is what I'm attracted to. What would you recommend to people who would like to take on a large interactive documentary such as Atterwasch? Do it. But do it by surrounding yourself with capable and complementary hard-working craftsmen and craftswomen. For me, web documentaries are a genre, not a trend of a fad. You are a storyteller. Tell a story that matters. Here is the fifth issue of foraged. Check out our spacey new project for National Geographic, listen to the sweet sounds of Wikipedia, discover the unlikely friendship between Matisse and Picasso and more. You can also see our gatherings in html form, enjoy. And to get future issues delivered straight to your inbox, subscribe here. Today we launched a new project into the outer reaches of the digital galaxy for National Geographic. Check out our immersive approach to the Voyager Space Program. We handcrafted the experience with a gorgeous soundtrack to match the stunning visuals, so turn up your speakers and enjoy! Here is the fourth issue of foraged. Research around a current project has made us a bit obsessed with the concept of time. Here are some of our gatherings in html form, enjoy. And to get future issues delivered straight to your inbox, subscribe here. We just shipped Issue 03 of foraged out over the internet. The last two weeks led us down some crazy roads where we found a few great gems. You can see the html version here. But if you like what you see and want to have it delivered to your inbox doorstep, subscribe here! If you come across any words in the real world while you're 'gramming' make sure to post them and add @refrigeratorpoetry to the description, we'd love to curate from more examples for our new feed.